I love me some Harley Quinn comic. Ain’t nothing wrong with that. Because Harley and Red Tool went into the locked room in the basement a few issues ago, a bunch of giant ant people have broken in to retrieve a giant cocoon. Harley and her friends try to fight them off, but once the cocoon is exposed to the sun, it hatches to reveal Zorcrom, a powerful, godlike, naked being from Strata. He sets off to destroy the world, starting with New York City. At first, Harley figures there’s nothing she can do against someone as powerful as Zorcrom, but then Atlee shows up to get her help in stopping him! Meanwhile, some mysterious forces break Harley Sinn out of custody and hire her to kill Mason in the Witness Protection Program. Double meanwhile, the mayor’s new aid continues her efforts to use vampires to rid New York City of its homeless problem. I think it’s very clear that Conner and Palmiotti love them some Atlee. (I forget, did they create her?) I think she debuted in their Power Girl series from a few years ago (which was excellent). And she was a guest star in their recent Starfire comic (also good). And now here she is teaming up with Harley Quinn for an adventure! Sounds like a fun time to me! Fighting an evil, glowing, godlike being is a bit out of Harley’s wheelhouse, but the issue is solidly entertaining and includes a lot of really good character work. I especially like the scene where Harley and her friends are hanging out on their roof watching the destruction, while explaining to each other why they can’t exactly take on Zorcrom on their own. 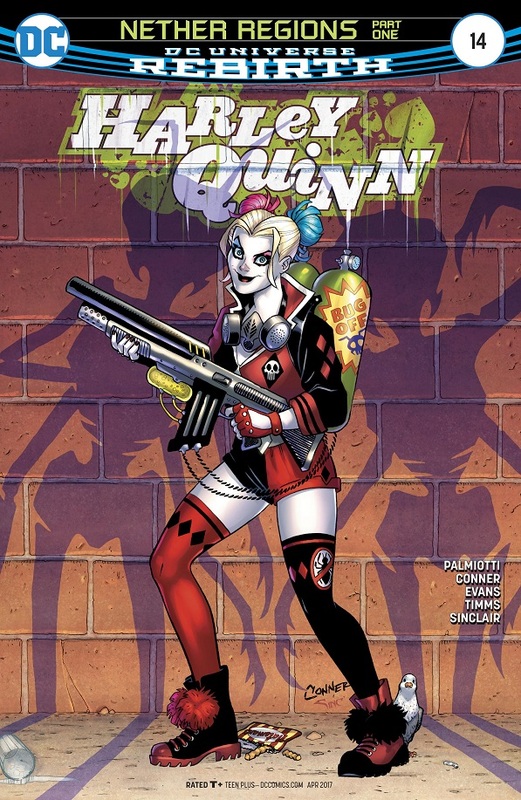 After recent events, this is the most interested I have ever been in Harley Quinn in the character’s long history. This series has its haters, but I love what the creative team is doing. I’m still convinced they’ve got some more big emotional bombs to drop on us, and I’m more than willing to be entertained by their crazy, glowing super-villain stories until we get there! The dark alternate reality Power Rangers story continues with a bit of an info dump issue! After Saba uses the White Falconzord to help Tommy and Billy escape Evil Tommy and his forces, the talking sword sits them down to explain what happened to this dark world: when the Power Rangers freed Tommy from Rita’s control back when he first became Green Ranger, Tommy decided to stay with Rita instead of joining the Rangers. With his help, Rita began to conquer Earth. Zordon and the Power Rangers fought to one last stand, where Zordon attempted to give the White Ranger powers to Jason, but Tommy interrupted the process, killed Jason and became the Evil Ranger he is today! 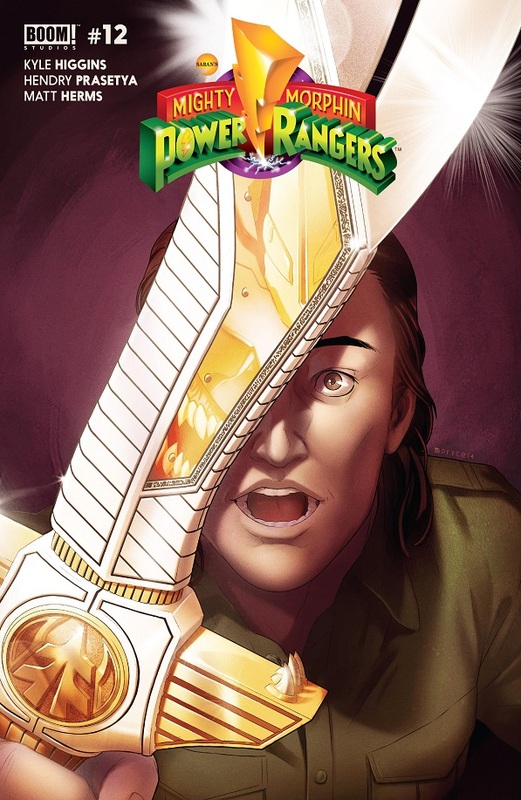 No sooner does Saba’s tale end than Tommy and Billy are captured by the Coinless, a resistance group who are likely composed of former Power Rangers. Another solid issue, but the info dump wasn’t all that fascinating, to be honest. It’s not overly clever or anything: Tommy stayed evil and the bad guys won. That’s fine, but simple. And it raises more questions than it answers. Like, if there was no White Ranger yet, then why is there both a functioning White Tigerzord and a White Falconzord? These are the nitpicky questions that must be answered! But I kid. It’s a fine enough alternate reality origin, and perhaps there’s more story to be told, but like I said, it’s basically just Saba telling everybody the basics of this universe. The issue is bolstered by the stuff that occurs outside of the recap, like Billy and Tommy’s reaction to Evil Tommy, which is a hoot. But really we’re just laying the groundwork for the fun to come! 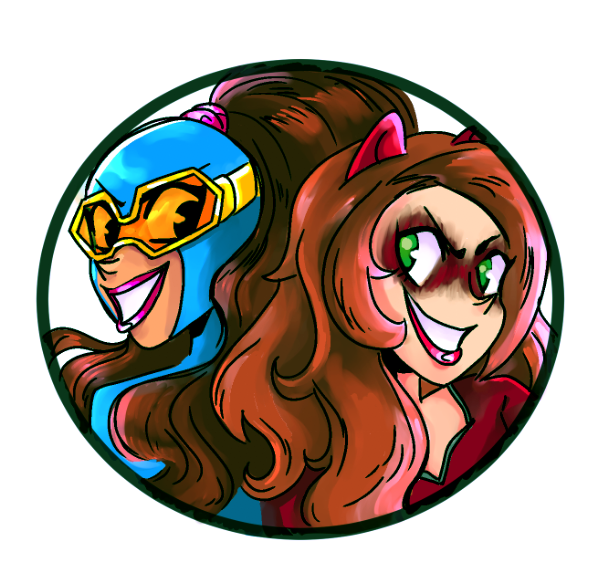 We’re back with Hellcat! I took the previous storyline off, but it was still a fun lark with Black Cat — even if it didn’t do enough to reference their time together in Marvel Divas. At a party at their office building, Patsy comes down with a cold that features reality-warping sneezes! She puts a Thor costume on Bailey, turns America Chavez into Canada Chavez and turns Jubilee tiny! She also summons her imaginary friend, stuffed tiger monster Mister Sniffles into the real world to terrorize everyone! Patsy and her friends both run and fight, until Patsy toughens up, gets her costume on and confronts Mister Sniffles — and they get along great! Turns out, Patsy has a lot in common with her imaginary friend, obviously. But then her sneezes turn Sniffles into a giant wasp and he starts chasing everybody again! So her sneezes turn Jubilee into a giant and Jubes squashes the wasp. The day appears to be saved, until Patsy sneezes again and disappears their entire building! Yeah, this was just plain silly fun, and I still dig that kind of comic. All the characters are super cute, and Williams’ art remains a true gem. This is just the funniest, silliest, most adorable comic at Marvel, and I hope it stays that way forever. Where else are you going to have this much fun? I love the way the characters play off each other. Leth has built some really bubbly friendships among her cast. I love the way art and comedy go so well together, with lines of dialogue just as cute as the art. I loved the bit where Patsy and her imaginary friend just start bonding instead of fighting, because of course she gets along with her imaginary friend — and of course a giant wasp would scare everybody! I think this is the most I’ve read an ongoing Avengers comic in a long time. I couldn’t even tell you who the main Avengers team is supposed to be! All I know is that U.S.Avengers continues to be pretty fun. 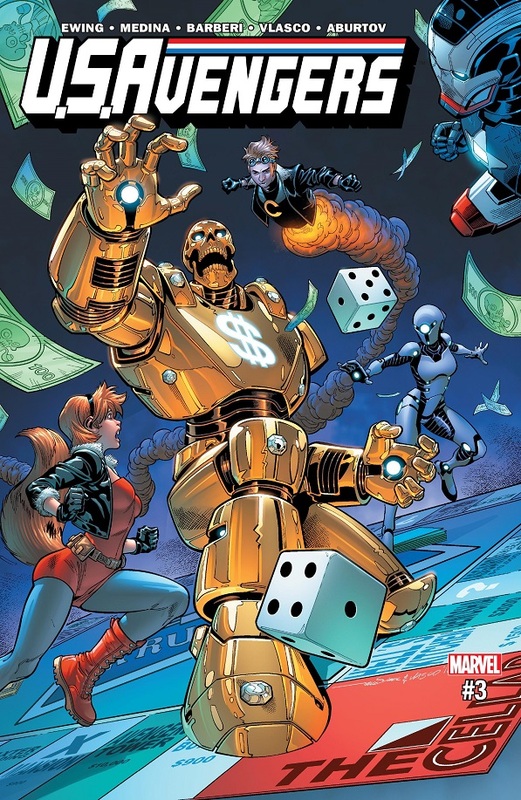 The Gold Skull has replaced all of the world’s billionaires with loyal robots, so the U.S.Avengers fight them off (turns out he stole the robots from Arcade). The team is able to zero in on Gold Skull’s HQ in an unfinished casino and the team heads over there to beat him up and free the imprisoned rich people. 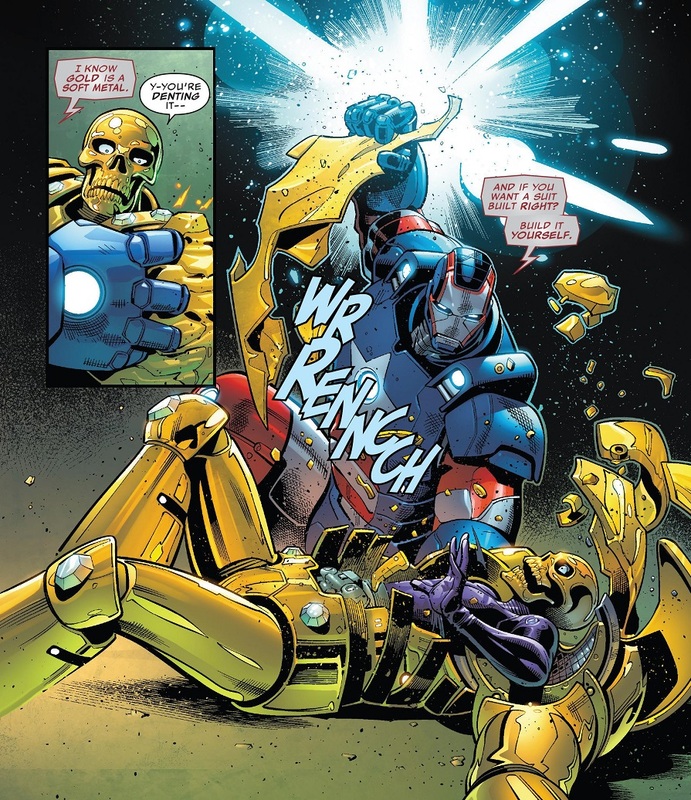 Enigma and Iron Patriot work together to neutralize and then destroy Gold Skull’s solid-gold armor (since gold is a soft metal and not a good choice for armor). Afterwards, Captain America takes Gold Skull back to her timeline and gives Roberto and the U.S.Avengers a bit of hope going forward. This is a fun comic. I daresay it’s probably the funnest Avengers comic being produced. I challenge any of those other Avengers comics, about which I know nothing, to even try to be as fun as U.S.Avengers! It’s got a fun roster of characters, all of whom bounce off each other quite well, and in entertaining ways. It’s got fun stories. And I really liked how they wrapped up the Gold Skull story quickly and with a bit of panache. Finally, a worthwhile Iron Patriot! A solid gold suit of super armor undone because gold is a crappy choice for making super armor? What a hoot! I know I’m a late-comer to Ewing’s brand of Avengers, but I’m having a blast. The roster works well together and is made up of characters I mostly enjoy, even the newbies. I can’t wait to see him dive a bit deeper into the team and their interactions. Everything is working with this comic right now. I know absolutely nothing about the Wildstorm Universe, save for being able to recognize a couple characters. I have no history with it and no personal stakes. But the idea of writer Warren Ellis getting free reign to recreate the universe from the ground up is tantalizing. Ellis is amazing, obviously. So why not see where this goes? I will be doing my best to keep reviewing The Wild Storm, providing the insight of someone completely unfamiliar with the franchise. Michael Cray, an operative with IO, attempts to assassinate Jacob Marlowe, the CEO of the Halo corporation, and a potentially centuries-old being who has big, devious secrets (though he seems nice and friendly on the outside). The assassination goes wrong for super-powers reasons and Marlowe ends up tumbling out of his skyscraper window. He’s caught by Angela Spica, a mentally disturbed woman who works in the IO engineering division and who has invented some sort of awesome Iron Man-esque super armor that grows out of her body. Her rescue of Marlowe is her armor’s introduction to the world, and soon both Marlowe and the director of IO, Miles Craven, are searching for Spica. Meanwhile, Zealot is some kind of super detective for some kind of super agency. And Voodoo is maybe a wannabe viral video music star planning her next big launch. There’s a lot to unpack from this first issue, and I get the feeling that almost every single page lays the groundwork for something down the line. 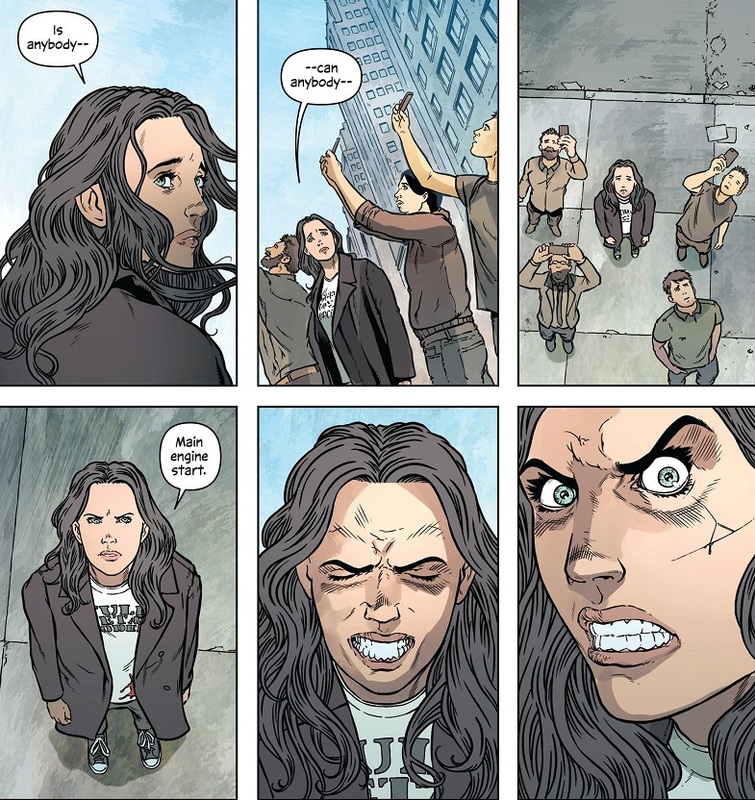 To that end, it’s a good, solid start to whatever Ellis has planned for The Wild Storm. We meet some interesting characters, some conflicts spring up and everybody seems set on a potentially interesting path. A couple of the characters even strike my fancy. I can’t wait to read more about Angela Spica. She seems neat. So is her armor voice-activated or does she just like to say it? But there’s nothing overall striking about this first issue. There’s nothing that gets my heart pumping or builds any excitement. Nothing to make me tell you to go get this comic right now and read it right away! This first issue is just a solid, foundation-laying start to what could be a bigger, more exciting adventure. I have hope. And new comic books are built on hope! The comics I review in my Hench-Sized reviews are just the usual comics I pick up from my local shop any given week, along with a few impulse buys I might try on a whim. So if there are any comics or series you’d like me to review each week, let me know in the comments. 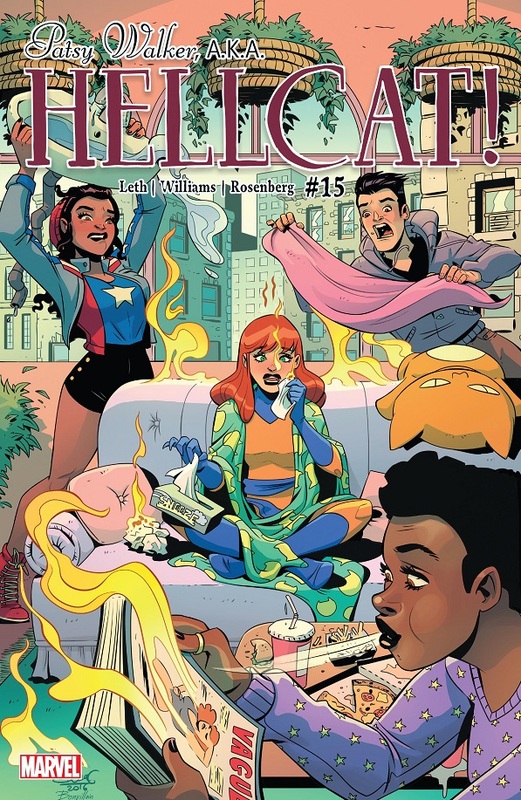 Posted on February 18, 2017, in Avengers, Comics, DC, Marvel, Reviews and tagged Harley Quinn, Hellcat, Mighty Morphin' Power Rangers, Patsy Walker, Patsy Walker a.k.a. Hellcat, Power Rangers, The Wild Storm, U.S.Avengers, Wildstorm. Bookmark the permalink. 2 Comments. Oooooooooh, I was wondering why the Thor costume didn’t have any pants…Thanks!